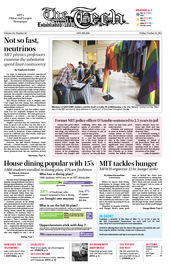 Members of LBGT@MIT hosted a colorful closet in Lobby 10 on Wednesday, a day after National Coming Out Day. Members of the MIT community were welcome to “come out” of the closet throughout the day. The new House Dining program is popular among freshmen, but less so among upperclassmen, according to enrollment statistics released to The Tech by the Division of Student Life. The mandatory meal plan for residents of Maseeh, Baker, Next, Simmons, and McCormick amassed a total enrollment of 1,888 students, 45 percent of which are freshmen.